My husband works in the mines, 16 days on, 14 days at home. How do we lessen the impact on his absence on our 18 month old. Our daughter gets extremely whiney for about two days after he leaves and when he returns she takes a few days to really warm to him. What can we do to lessen the stress of her daddy coming and going for long periods. Often Dad’s do work away on rotational rosters in mines or for even longer periods away from family such as those Dads’ in the Defence Force. The whininess you describe is her adjusting and being stressed from him not being around, by the time the 16 days roll over she has adjusted and is in the routine with you then Dad arrives home again. 14 days at home is a fair time to be home so you can see that by the end of the 2 week home time she has once again adjusted and is comfortable and it all starts again. There is no solution to fixing this for your daughter, as she will have to emotionally continue to adjust all the time. There are strategies to lessen this impact – I often teach parents how to set a routine up for the day and how to keep this routine the same when Dad is away. One of the tricks here is to make sure that what you set up when Dad is here can be done when Dad is away. 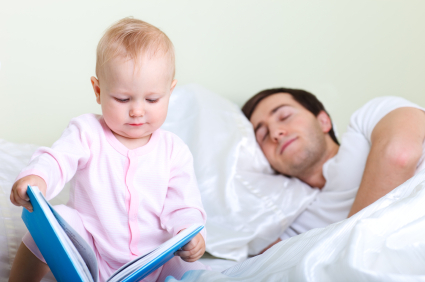 For example, night time routine of putting her to sleep – if say, Dad read the stories, then lay down with her until she fell asleep then this isn’t able to be repeated when Dad leaves again. Reading the stories is fine, however I would also alternate between mum and dad reading when dad is home. Aim to keep her routine the same regardless and Dad really has extra time during the day with her. I also suggest having lots of photos around the house of the whole family. There are lots of other little tips such as have Dad read her favourite books and record this so that she can play this at bedtime or other times. Skype is another fantastic option and works much better for children than phone conversations.